As the Character Man. Courtesy photo. 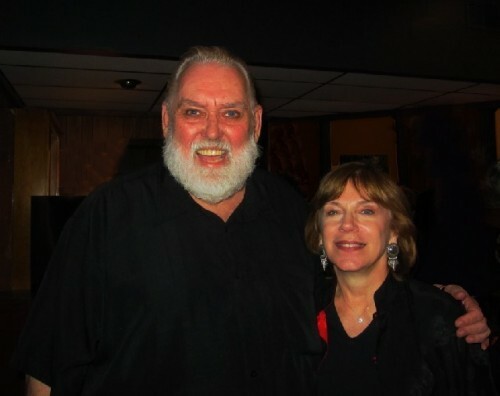 With Julianne Boyd in 2011. Giuliano photos. Relating a full life in theatre. Music and Lyrics by Leslie Bricusse, Jerry Bock, Betty Comden, Stan Daniels, Fred Ebb, Adolph Green, Sheldon Harnick, Jerry Herman, John Kander, Bob Merrill, Anthony Newley, Stephen Schwartz, Stephen Sondheim and Julie Stein. James Brochu is a big bear of a man with a warm and playful lilt to his style. 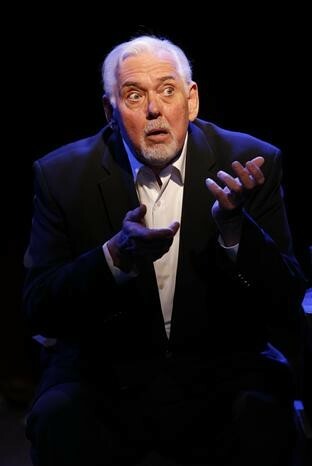 For me, last night at Barrington Stage for his one man show Character Man, the porridge was just right. The one act, close to ninety minute experience, both amused and informed about a rich and colorful life in theatre. Starting as a teenager selling orange drinks from the back of the house during intermission. Often he stayed through the second act because of an enduring fascination with the actors. The theme of selling orange drink starts at just fifty cents. As the narrative progresses the passage of time is marked by price increases, to a buck, then three. Finally he admits that during a recent visit to the back of the house “I can’t afford it.” How true as you have to take a second mortage to afford Broadway tickets. Exiting the theater I asked him about that. It seems that as a kid he could sit in the last row of the orchestra on Broadway for just fifty cents. His father had a passion for theatre but chickened out before an audition. On the subway ride home he noted an ad recruiting Wall Street runners. That provided the financial security to indulge a passion for Broadway and his favorite watering hole Toots Shors. There on Friday nights he regularly enjoyed seven course dinners. All liquid. Brochu tells us that he didn’t know that his father was a lush until one time he saw him sober. Among his Dad’s drinking buddies was Dave Burns one of many Character Men we come to know in this engaging, nostalgic, absorbing evening of theatre about theatre. The two time Tony winning actor became this kid’s mentor and friend. When he first earns a role Burns informs him that he’s a character man. One of those under the radar supporting actors that make the stars look good. But are indispensable to play off. Then barely twenty he was told that it would be a score of years before he would find regular work. It seems character men, and women, come into their own starting in their forties. Until then you sell orange drink in the back of the house. That included hanging out at Sardi’s where his pal Burns finally earned a caricature. Years later Brochu was similarly honored. Relatively young he even got voted into the Players Club in Gramercy Park. The venerable club occupies the former mansion of Edwin Booth. Critics are anathema but now and then I have snuck in when staying at the National Arts Club next door. 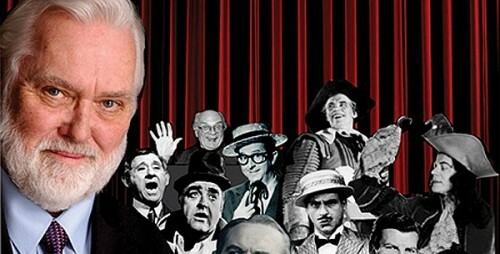 Between all of those wonderful anecdotes he sings/ recites iconic show tunes “Mr. Cellophane Man” from Chicago, “If I Were a Rich Man” a tribute to Zero Mostel in Fiddler on the Roof and “(Ya Got) Trouble from The Music Man. He burns down the house relating the sordid tale of Holywood character man David Colowitz who became so rich and famous that every movie star lined up in his dense schedule of sexual partners. In the "Butler’s Song" from the musical Enter Laughing (So Long, 174th Street) he takes a call from Greta Garbo who wishes to speak with Colowitz. That’s quite impossible as “He’s screwing Delores Del Rio” with Jean Harlow at seven and Mae West eleven. What follows is a who’s who of glamorous leading ladies of a bygone era. What gossipy fun. It is an evening of delicious bits and pieces of a life in theatre. We meet the famous as well as the not so: Jack Gilford, Barney Martin, Stephen Schwartz, George S. Irving, Cyril Ritchard, Charles Nelson Reilly, Kathleen Freeman, Joan Crawford, Jackie Gleason, Roland Winters, Jimmy Cagney. Encountering these icons of stage and screen was not always easy. During a street encounter with his, idol Zero Mostel, the young Brochu begged for an autographed photo. Zero screamed at him “You’re not worthy.” A few days later one arrived in Brochu’s dressing room. Brochu has a special affection for the tempestuous Mostel whom he physically resembles. 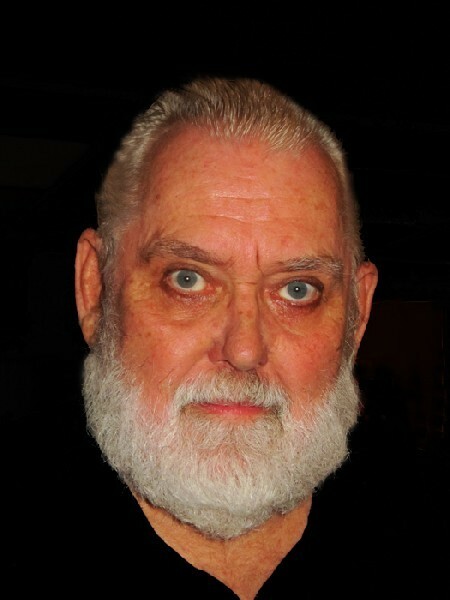 Previously he appeared at Barrington Stage in the one man show Zero Hour. He is self effacing in telling us how he insinuated himself into the presence of Cyril Ritchard. Part of that was being an errand boy. Having fetched a corned beef sandwich with two pickles and cole slaw on the side he asked ever so shyly if he might sit while the actor enjoyed his meal. That evolved into a weekly ritual and friendship leading to an introduction to the imperious Rex Harrison. Who, like Garbo, just vanted to be alone when he and Ritchard were dining at Sardi’s. A fan asked him to sign her program to My Fair Lady. She informed the star in a gush that she had waited a year for a ticket to the show. Harrison, the handsome smarmy beast, told her to buzz off. The enraged and indignant lady rolled it up and smashed it over Harrison’s head. Forgive me for revealing the punch line but it is so hilarious I just can’t help myself. If you don't want to know stop reading here. Sorry about that but, trust me, this evening with Brochu is more fun than a barrel of monkeys.